Bomber Wrestling Greco Roman Technique Camp is one day away! Greco-Roman Wrestling Style! Kick off the new year with some wrestling wings! 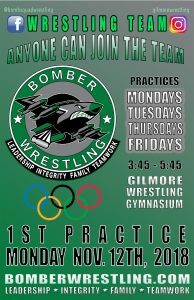 We hope you’ll join us for some exciting technique on the Bomber wrestling mats! 2 sessions each day for 4 days. Dates: January 1st – 4th, 2019. 2018-19 Bomber Wrestling Season ready to hit the mats! 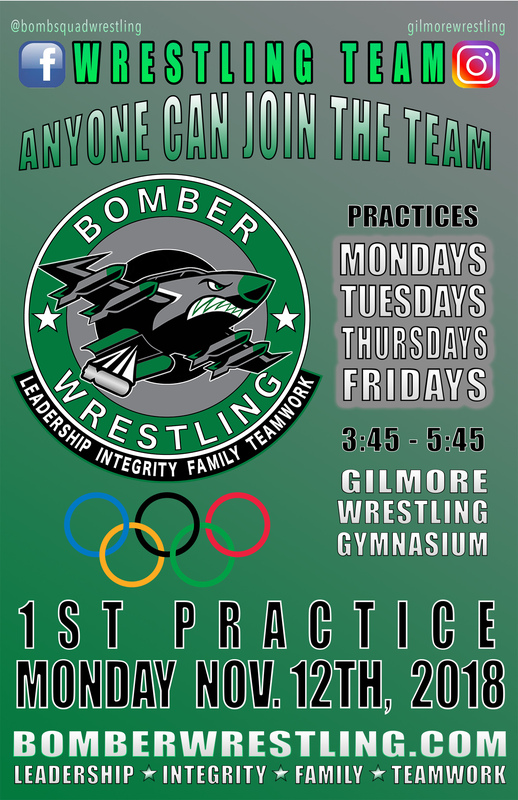 Bomber Wrestling is excited to return to the mats for the 2018-19 wrestling season. Our wrestlers are ready and our coaching staff is ready, but as strong as we have become we understand that the work on the mats is only a part of the recipe for success. We’ve come a long way and made strides due to our support from our schools teachers, administration and, staff. They and our wrestling parents and community have been behind us at every turn, cheering on, supporting, and lifting up the efforts of our athletes as they pursue excellence academically, as members of our community and, on the mats as representative athletes for the great sport of wrestling. When the team wins, we all win. We consider every parent, every teacher, every person in our community as a member of our team. There’s a lot of work to do, but working hard and smart is what we look forward to. We know the rewards are worth it and it’s one of the ways we earn your respect. Let’s get to work. Go Bombers! Please click on the signup link above to get started. as the “Bomber Move of the Week” award recipient. There’s an old saying, “What we lose in the fire, we’ll find in the ashes”. In her time as a Bomber Wrestler, Amara has experienced the challenge of loss in ways that not many of her peers are able to comprehend. Where others may have given up, she’s displayed strength. Where others may have been reckless, she found focus. Like the legend of the Phoenix, Amara has been through the fire and risen from the ashes. Greco Roman wrestling, some say, is akin to carrying a significant weight, in an unfamiliar direction, lifting it as high as you can, and then, letting it go. It’s no surprise that Amara has taken to Greco Roman wrestling so well. Amara trains with intention and battles on the mat like a seasoned veteran. Her ability to learn complex techniques is a result of her attention to detail and the importance she places on continually improving. Whether it’s a suplex an arm throw, a superduck or a lateral, you can count on Amara to put 100% of her effort into mastering the technique and applying what she’s learned in her matches. You can be sure, that when Amara is competing, you’re in for an exciting match and are witnessing an emerging champion. WHEN THE TEAM WINS, WE ALL WIN! Congratulations Amara! You’ve earned the Bomber Move of the Week!